Published on Tuesday, November 22, 2016. This article appears in the October/November 2016 issue of American Craft Magazine. In her new book, live form: Women, Ceramics, and Community, Jenni Sorkin offers a compelling look at three iconic figures of the modern ceramics movement: Marguerite Wildenhain, a Bauhaus-trained émigré who presided over the Pond Farm artists’ workshop in California from 1952 to 1980; Mary Caroline (M.C.) 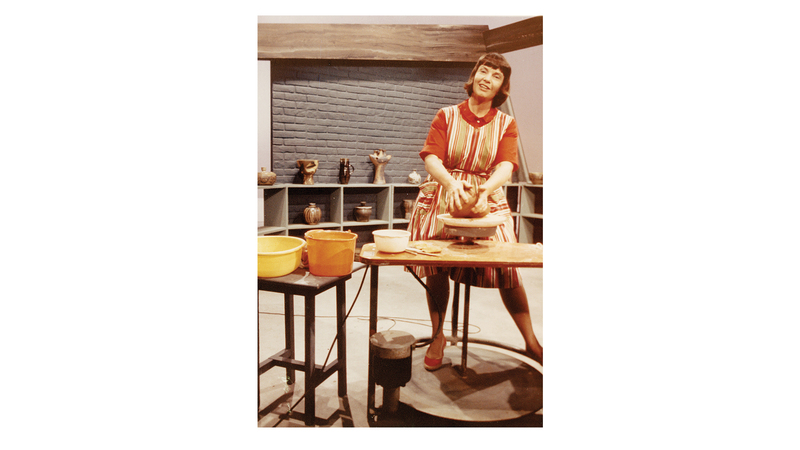 Richards, author of the influential philosophical guide Centering in Pottery, Poetry, and the Person; and teacher-scholar Susan Peterson, referred to as “the Julia Child of ceramics,” who reached a broad audience as host of her own demonstration show on public TV in the 1960s. Through their pioneering, hands-on style of teaching and community engagement – using pottery as a “live form” of creative experience – these women laid the groundwork, Sorkin asserts, for the participatory, socially engaged artistic practice of today. An assistant professor in the history of art and architecture at the University of California, Santa Barbara, Sorkin has written widely on the intersection of gender, material culture, and contemporary art. She was in Los Angeles recently for “Revolution in the Making: Abstract Sculpture by Women, 1947-2016,” a sweeping exhibition she co-curated with Paul Schimmel at the Hauser Wirth & Schimmel gallery. We met up with her there to talk about her new book. Why did you feel Live Form was a story that needed to be told? There has been a lot of interest in thinking about the ways in which different kinds of non-traditional practices, like fiber, have influenced work today. I was interested in looking at an earlier group of women, midcentury women. When I was in my 20s, I worked on a large-scale exhibition of the 1970s called “WACK! Art and the Feminist Revolution,” held in Los Angeles at the Museum of Contemporary Art in 2007. Working on that show – as a woman, at that age – propelled me to go back to graduate school, really [look even] earlier, and think about the generation of women we might call protofeminist – who would not have called themselves feminists – who were really changing the landscape socially, through the means that they had available to them. They were excluded from painting and sculpture, but ceramics, it turns out, was a place that was amiable to women. It offered women the ability to both earn an income through selling wares – because you could always make things people could buy – but also through pedagogy and teaching. And the idea that ceramics was an untapped field, because it was an other. It was exclusionary, secondary, minor, decorative. It had a history of women’s work attached to it. So I became keenly aware of and interested in that framework. And that became your focus. I have a studio art background as a fiber artist, and I always thought my first book would be about fiber in some capacity. At some moment in graduate school, this switch just happened – it was like a light came on – and I fell for the story of Marguerite Wildenhain. I became interested in trying to figure out how to tell this narrative that had to do with a misunderstood figure in the landscape of American craft, who was considered hard-core, European, traditional, entrenched in her own values, and in a Bauhaus trajectory, but [had other facets] if you look closely at her. And there really hasn’t been scholarship on any of these women I’m covering. One of the legacies of American craft in this country is that there has been a paucity of writers and historians who work on this material. There are many exhibition catalogues, and a lot of archival work still to be done in this field, untapped. There have always been curators who have made shows in American craft history, and it has always been a field housed in the decorative arts departments. It’s been object-oriented, instead of asking deeply theoretical questions. My book aims to create a theoretical framework for rethinking ceramics as a performative medium that is not necessarily object-based – that really has more in common with some of the social practice work we see today, that is a precursor to it. Much of the teaching and legacy of ceramics practice, in fact, has to do with building community and less about the objects themselves. So you started with Wildenhain. How did you choose the other two women? One of the criteria became their own legacies and relationships to writing. They all left behind a body of work that in some ways exceeded them as individual artists, [in] that their writing and teaching became ultimately more valuable historically than their [clay] work. I would say, of those three, Wildenhain’s [pottery] has been considered as important. M.C. Richards came to pottery very late in her career. She always considered herself an amateur potter. 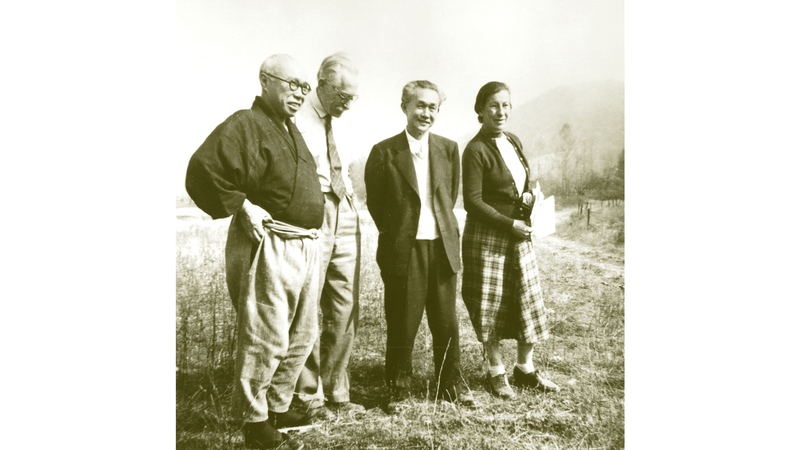 She was a professor of literature at Black Mountain College and a theater director and a translator. She came out of an avant-garde artistic sensibility that she translated to craft, versus the other way around. Susan Peterson, on the other hand, comes directly out of craft history, but she’s never been given any kind of recognition. Even in her home city of Los Angeles, she is really underknown. You have to say she was Ken Price’s first teacher for any kind of vague recognition to register. But she did publish quite a lot. She was the person I was able to meet, out of the three of them. I interviewed her, and she knew I was writing this book. This issue of our magazine has a theme of mastery. Do you think there is a different dimension to the idea of mastery for women artists? I’m going to put myself out there and say I think mastery is a male ideal, not a female ideal – although somebody like Wildenhain would very much disagree with me. She really had a sense of mastery, both about herself and her own work, and also about the kind of work and working habits she tried to instill in her students. She came out of the Bauhaus tradition that did believe in mastery. She attained master potter certification as the only woman potter at the ceramics workshop in Weimar in 1925. I think her own relationship to mastery was propelled forward by the fact that she was a woman and had to prove herself, and that being a master, for her, was in some sense of the word about establishing an equal foothold as a woman artist. What concept would you use to describe the idea of mastery? Self-actualization? Coming into one’s own as an artist? Becoming comfortable with the material, expressive? Those are all good concepts. I think the larger issue of mastery is that it has been cast off now as a value in craft practice. There is a lot of playing with material, and playing with it as an amateur, which is encouraged highly now in art schools, art circles, and even in material-based programs and departments. We no longer have the same hierarchy of materials, and when the hierarchy of materials diminishes, mastery goes out the door. What would you most like for readers to take away from your book? I’d like people to understand that a scholarly read can also be a really moving read. That you can get absorbed in these women’s lives and livelihoods, because they have something to teach us even though they have passed on. They were never in their own lifetimes, I think, regarded properly for the kinds of advances they made. It’s only now, in our era of social-practice art, that these three women could be reclaimed, and thought of as pioneers of that social practice. Ceramics has not been connected to social practice yet, except maybe by an artist like Michael Strand, who is doing social practice work through found mugs, mug swaps, things like that, and he does a great job. But trying to think about the crafts as actually pioneering social practice, rather than it all coming from performance art or from the so-called fine arts, is a really important shift. That is why I feel most compelled to have written this book. I get very frustrated with my own peer group, and students, who don’t understand that making craft-based objects also is incredibly performative, incredibly non-object based. That there is no preciousness when you throw pot after pot after pot and you grind it down as Wildenhain had her students do. An unknown or forgotten fact of her practice is that her students didn’t fire. She wasn’t interested in having them fire. She wasn’t interested in glaze technique. She was interested in form, but form through throwing. And form through throwing becomes a metaphor for process itself – how you work in a daily way as a potter and embody that livelihood and lifestyle. Live Form: Women, Ceramics, and Community was published in July by the University of Chicago Press. 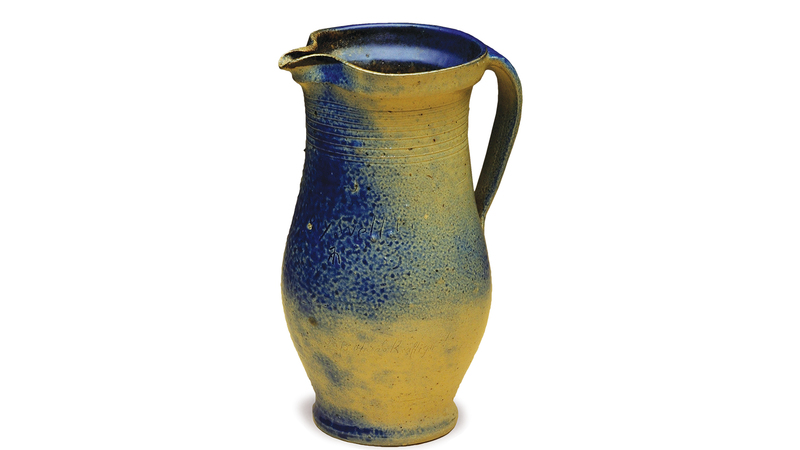 Wildenhain made this Milk Pitcher (1923) during her years at the Weimar Bauhaus. She was the only woman at the ceramics workshop, and in 1925 (the same year the workshop was shut down) was the first woman named a master potter in Germany. 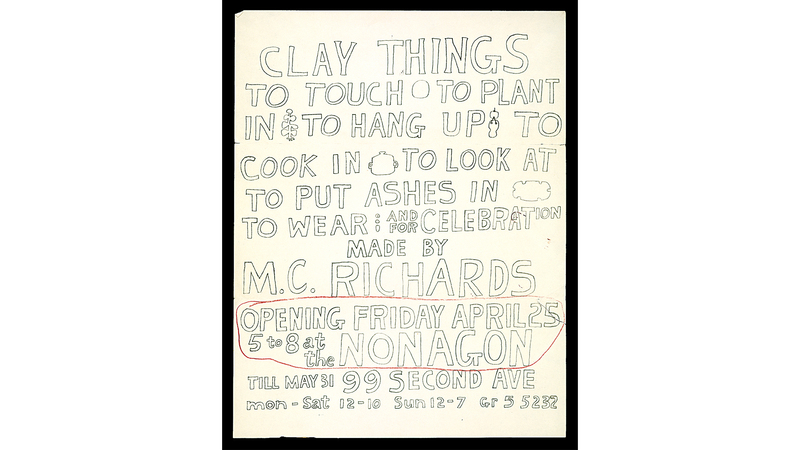 In 1958, Richards staged this event in the East Village – a year before Allan Kaprow’s 18 Happenings in 6 Parts. The otherwise undocumented evening disputes the conventional narrative that men led the experimental performance art movement. 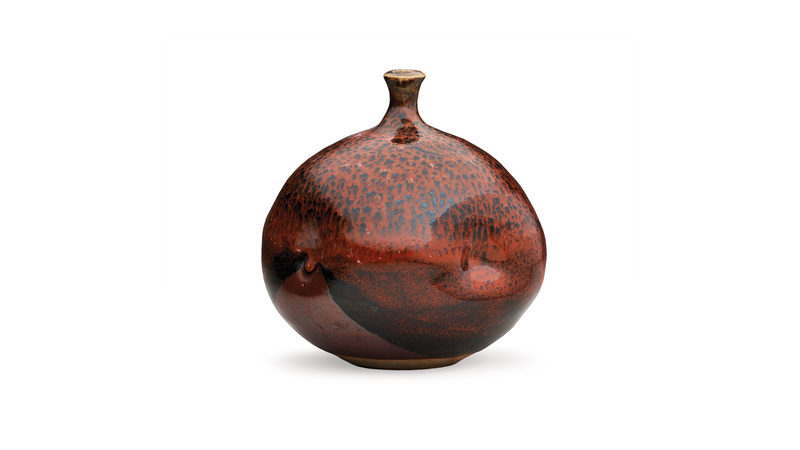 Richards taught English at Black Mountain until 1951 – returning in 1953 as a student of ceramics. The following year, she moved to Stony Point, New York, to join an artists’ cooperative that included John Cage and Karen Karnes. 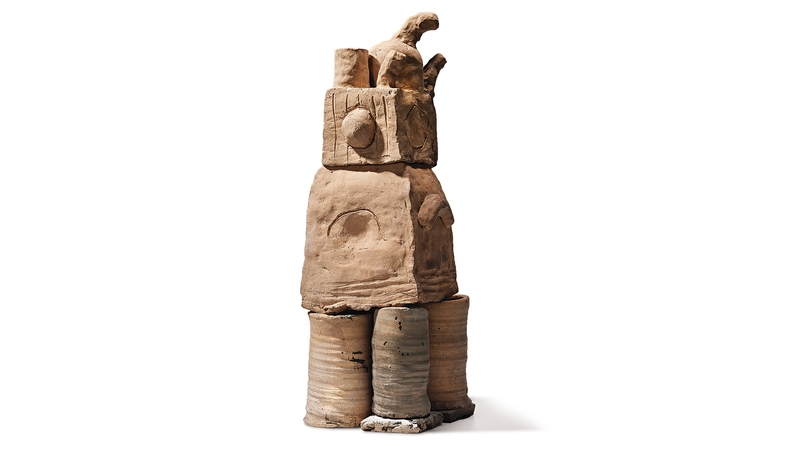 By the 1960s, ceramics was an outmoded technology in need of a wider audience, Sorkin writes. 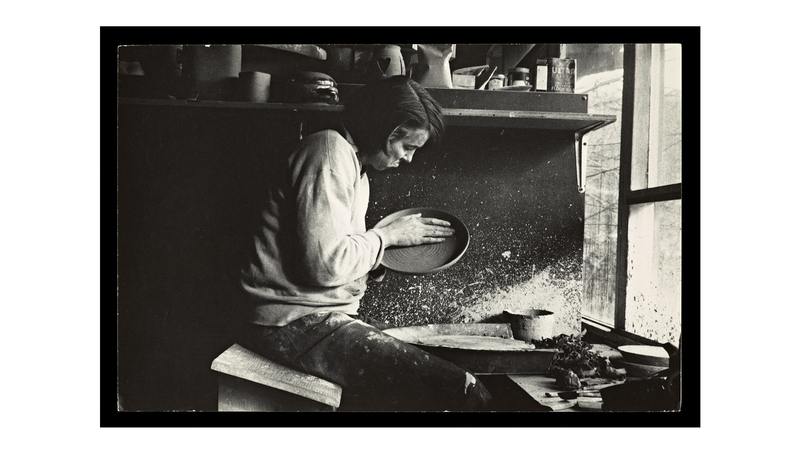 An accomplished ceramist, Peterson cannily understood that, reaching a broad public via the 54-episode Wheels, Kilns, and Clay. While at Stony Point, Richards wrote her influential book Centering in Pottery, Poetry, and the Person. Prizing process over skill, Richards “returned clay to its roots,” Sorkin writes, focusing on the links between materiality and feeling one’s way in the world.